Includes: Brendal’s famous complimentary Rum Punch! Scuba Dive & Snorkel Trip with Fresh Seafood Prepared on the island for Beach BBQ (and Hand Feed the Rays) Day! 12:30pm - 3:30pm = On the Beach/Island for BBQ Lunch, Music and Fun! Snorkel or Reef Dive then stop at uninhabited beach for lunch break and collecting shells then onto Wild Dolphin Encounter where you can watch/take photos from vessel or get in the water with mask, snorkel, fins. The dolphin encounter is a not trained dolphin. The dolphins are wild and is in their natural ocean surroundings. There is shade and toilet on vessel. Water, ice large cooler are complimentary. Join us on the ONLY DIRECT TOUR to Guana Cay for Nippers Sunday Wild Bore Pig Roast & Music at their Beachfront Restaurant & Bar with Pools and snorkeling at the beach. Also see and feed the adorable and friendly Abaco swimming pigs along the way. The vessel is island hopper with water, ice, shade, toilet and music. Complimentary Island Drinks & Fruit Punch served on way there. See and feed the adorable and friendly Abaco swimming pigs. Great for all ages and families! Short 2.5 hour tour, or it is included with our Island Hopping Sunday Tour Day (see above). Feel the breeze in your hair and whispers of wind on your face while you sail and cruise! Enjoy sailing the "real way" with your captain with over 25 years experience. The vessel is equipped with bathroom, galley, music, water, ice and complimentary Island drinks & Fruit Punch served with cruise. Family Specials for 2 or more kids! We take you on our vessel to kayak at great uninhabited inland creeks and experience Turtles in the Wild to view. Our main vessel has shade, toliet and music. Choose double or single kayaks with paddles and watersport vests. People can also beach comb on this trip. Lunch break is at great island beach area where people can enjoy. 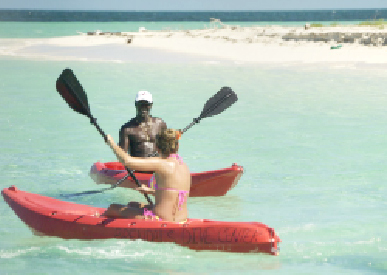 Included: Transportation to kayak area Kayaks, paddles, watersport vest, mask, snorkel, fins. served at lunch break at the beach. Bring your own equipment or rent ours! We have Masks, Fins, Snorkels, Regulators, BCD, Belts & Weights, Tanks, Wetsuits, even Bicycles and Kayaks! Click here to see tons of amazing under water and above water island photos.